Being of a certain age, I have several over-80s in my life and have lost several more dear to me in recent years. Some have aged well – I have a lovely memory of my 90-year-old aunt executing high kicks in her kitchen a few months before she died, delighted when H couldn’t match her – and some not so well. Penelope Lively seems to be managing it with grace and eloquence. The first part of her evocatively named Ammonites and Leaping Fish is a meditation on how it feels to be old: the loss of a beloved husband, the bodily aches and pains, the solaces and the changes seen. It leads us to a chapter on Lively’s life, an essay on context: her childhood in Cairo, her experience of the Second World War, how it felt to view the Suez Crisis from Britain while feeling more affinity with Egypt and bringing up a family in the Cold War. The chapter on memory talks of Lively’s fascination with the way that memory works and how that fascination has played into her fiction. We learn more of her own life through a series of snapshots – her most vivid memories from each of her eight decades – illustrating the way in which our memory changes as we get older. Perhaps inevitably, my favourite chapter is on reading and writing. Reading has always been a fundamental part of Lively’s life. She talks eloquently of the way in which reading feeds into writing, of finding what you like often through reading what you don’t like, of the books to which she returns and names her three desert island novels – Henry James’s What Maisie Knew, William Golding’s The Inheritors and, much to my delight, Ford Madox Ford’s The Good Soldier, a personal favourite. 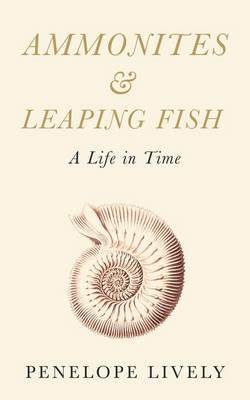 I defy any reader not to enjoy a warm cosy glow when they read the sentence ‘To read is to experience.’ The final chapter takes six of her favourite possessions, including the eponymous ammonites and leaping fish, illustrating them and explaining why they are so important to her. It’s not so much a memoir as a series of carefully considered reflections which together form a beautifully expressed illumination of a long life. The Observer’s New Reading column mentioned several reviews on Amazon complaining about the rip-off price of £1.99 for Lively’s short story, Abroad, which both saddened and annoyed me. As H pointed out £1.99 will buy you around a third to a half a glass of wine depending on the quality, and I’m sure the quality was high. We’ve all become used to paying very little for books but perhaps we forget to consider how much enjoyment, and some times enlightenment, we’re buying, and how many people need to be paid to produce a book, not least the author although they often are at the bottom of the pile. What do you think? Is £1.99 too much for 4,000 well-chosen words or do you think it’s fair? This entry was posted in Random thoughts, Reviews and tagged Ageing, Ammonites & Leaping Fish, Fig Tree, Memoir, Penelope Lively, Penguin on 18 November 2013 by Susan Osborne. This sounds like a lovely read. Re the 1.99 complaint – good heavens! I so agree with you, and I’d add that I’d like these people to experience the sky-high price of books in Australia! I’m just about to send a copy off to one of my over-80s – I think she’ll like it. Thanks for the £1.99 comment. I think we’ve undervalued books here, and probably, in the States to the extent that many people begrudge paying a fair price. I’m sure that if they thought it through they would be more forgiving. Sounds great and has made me pick up What Maisie Knew off the shelf, will be taking it on a flight this evening, Henry James can be challenging at the best of times. I’m sure Ms Liveley would be delighted to hear that. Hope it makes the flight bearable. I am having to hold fire on this. Normally I would read anything new by Penelope Lively at the first possible moment but someone has put it onto a book group list for next October and so I feel it would be better to wait and read it then. How do I manage to keep my nose out of it? Oh dear, that’s a long time to wait but it will be worth it. A good one for a book group, too. Lots to talk about.